The next Robber Baron Open House is scheduled for Saturday, November 11, 2017 from 9am to 3pm. This special event only occurs once every 18 months, so don’t miss this rare opportunity! The Open House is open to the public. Robber Baron Preserve contains a unique cave and species, but is located on a small lot along a busy street in the middle of a densely urbanized neighborhood of San Antonio. As a result, the cave and property have many special considerations. TCMA attempts to balance protection of the cave with education, science, and recreation while being part of the neighborhood it resides in. The surface of the property has been transformed from an overgrown vacant lot into a park-like green space open for visitation. Non-native plants were removed, water flow was adjusted to prevent contaminated water from streets entering the cave, and the entrance was improved to permit more access by species that use caves as their home. By maintaining it as a publically open green space area, we are attempting be part of the neighborhood and provide a place to learn about caves and karst, while reducing vandalism issues. The Preserve has a short trail and bridge from which the sinkhole can be viewed. A kiosk provides information about Robber Baron as well as caves in general and TCMA. Two picnic tables are available for visitors, and steps lead down into the 40-foot deep sinkhole where the entrances may be seen. Robber Baron Cave has been very heavily impacted by more than 100 years of frequent visitation. Where there once were formations, there are now only barely visible broken stumps. Where there once were clean limestone walls, there are now spray-painted names in gaudy colors. Where there once was thriving cave life, there are now only empty corridors, half filled with silt. However, things are slowing changing. Since the entrance was gated in the 1980s, impacts to the cave have been reduced. Ongoing projects to clean up the spray paint graffiti and to remove the washed in fill have reversed some of the damage. The restoration of the sinkhole has improved the flow of water, air, and fauna in and out of the cave. Bats are returning along with other cave critters. The walls are being slowly returned to their original state. 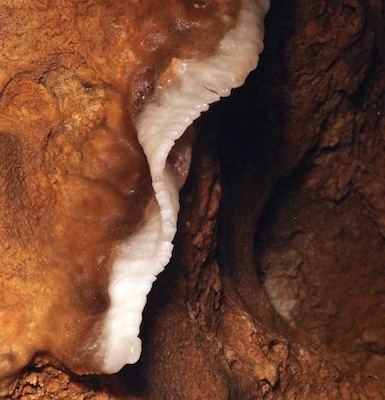 Even a few hints of new formations are beginning to appear—and some long hidden formations on remote or previously hidden parts of the cave have been discovered. A few formations remain in Robber Baron Cave, tucked in out of the way locations, hinting at some of its former beauty before more than a century of careless visitation and vandalism. 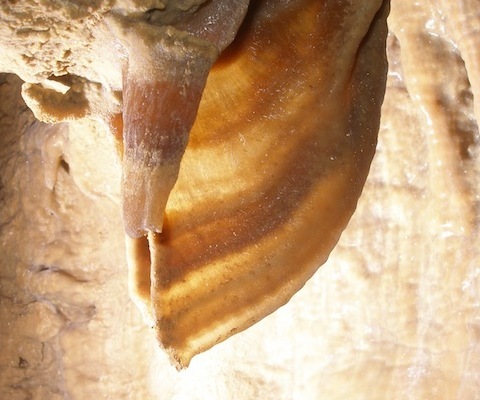 TCMA manages the cave as a karst resource to preserve its unique biology, geology, and history. Its central urban location and easy access makes it an ideal educational resource, and TCMA uses it to provide a place where people can learn about and experience the underground environment. WOAI TV News 4, March 1, 2012, "Scientists study S.A. cave for space research: Key to finding life on Mars?" *We are currently seeking a copy of this video. If you have a copy or know where one can be obtained, please contact the Preserve Manager. WOAI TV News 4, October 9, 2010, Randy Beemer visits Robber Baron Cave. WOAI TV News 4, April 4, 2003, Randy Beemer interviews Linda Palit. Filmed during the restoration project, showing partial removal of the old bunker entrance. Texas Parks and Wildlife, Landowner Incentive Program Bulletin, Spring 2010, Volume 4. San Antonio Current, January 7, 2009, "Alamo Depths" by Mark Jones. San Antonio Light, October 15, 1922, "Find Ancient Ring in Cave". San Antonio Light, October 6, 1922, "'Lost' Explorers Emerge from North Loop Cave as Rescue Party Underground". San Antonio Light, September 25, 1921, "Caves Near San Antonio". San Antonio Light, March 26, 1911, "Mystery of Wonder Cave Is to Be Solved". San Antonio Light, March 4, 1909, "Indian Tomb Yields Dead". You can help Robber Baron Cave. If you are interested in helping us protect and maintain this unique and special part of San Antonio, please consider joining Friends of Robber Baron or donating to TCMA to help maintain Robber Baron Cave Preserve. Donations may be made online, or checks may be mailed to TCMA, P.O. Box 7427, Austin, TX 78713. Please indicate on the check that it is in support of Robber Baron Cave Preserve.